Atheneum Books for Young Readers, 9781534433410, 272pp. An inquisitive polar bear named Duane befriends an array of animals as he discovers where he belongs in this charming classic-in-the making that’s reminiscent of Winnie the Pooh. In the Very, Very Far North, past the Cold, Cold Ocean and just below the hill that looks like a baby whale, you’ll find Duane and his friends. Duane is a sweet and curious young bear who makes friends with everyone he meets—whether they’re bossy, like Major Puff the puffin, or a bit vain, like Handsome the musk ox, or very, very shy, like Boo the caribou. For these arctic friends, every day is a new adventure! Dan Bar-el is an award-winning children’s author, educator, and storyteller whose books include Audrey (cow), Not Your Typical Dragon, and The Very, Very Far North. Dan has worked with children ages three to thirteen as a school-age childcare provider, a preschool teacher, a creative drama teacher, and a creative writing teacher. He also teaches with the Creative Writing for Children Society. Dan lives in Vancouver, British Columbia, with artist and goldsmith Dominique Bréchault, and Sasha, the most adorable cat in the known universe. Visit him at DanBarel.com. Kelly Pousette is an illustrator and storyteller, originally from the west coast of British Columbia. She loves to create things, especially pictures. Her work has been featured in The Huffington Post Paris, The Brown Paper Bag blog, and Brightness Magazine. She currently resides in northern British Columbia with her husband and very large dog Clovis. 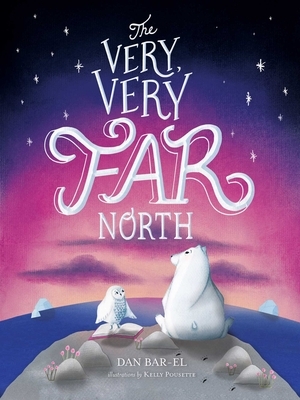 The Very, Very Far North is her first book.